What situation or application makes you interested in prefabricated buildings? Are you looking for a portable office, or do you need something like a portable mini storage? 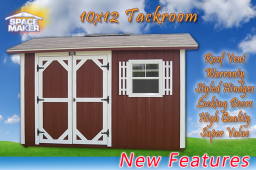 The 10x12 meadow lark gable can be a versatile way to solve your needs in almost any application without having to choose a prefabricated building; all of our options can be customized to your need and are built to order. 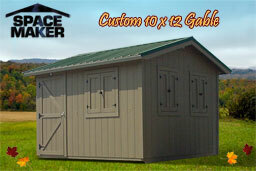 Use this gable as a small portable storage or add your workstations to create an office. Opt to turn it into a dog house, a play house, a wood shed, or any other utility that meets your needs without worry that the building will take up too much space in your yard. 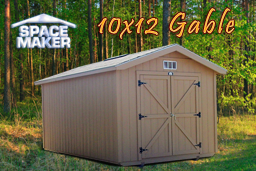 The 10x12 size is perfect for a portable mini storage building, able to house large yard and pool equipment and tools or even store your ATV, bicycles, and other small transportation for which you have no room in your garage. You can count on this gable to provide ample room for whatever you need to store in an organized fashion. Best of all, if you need to move to a new home or rearrange your backyard to create more room, the portable storage room is easily moved from one place to another. Unlike prefabricated buildings, this building is built to your specifications and can be customized in several ways. 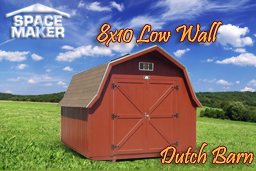 The 10x12 meadow lark gable also incorporates Western Fir siding, which uses a baked on primer to extend the life of the exterior paint so that you can expect your building to look good for years to come with little or no upkeep. Double doors with a metal threshold and heavy duty hardware help to hold out the weather and keep temperatures inside consistent. You can even opt to add a second set of doors on another wall, if you prefer to access the portable storage building from more than one point. 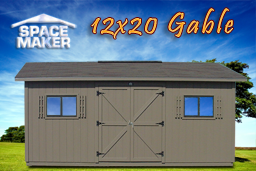 Regardless of the reason you are looking for extra space through the use of an outdoor building, the 10x12 gable is a great solution, as all of our products can be. If you need something a little different, check out our other designs as well as our ability to create custom buildings to meet your needs.